This morning was life coaching at the church and as usual it was a fantastic time. I absolutely love, love, love this time with my ladies. After life coaching I went to grocery shop and get things for our Father's Day dinner. We are going to be spending it with the Currie's and BBQ'ing. Larry requested that I make his favorite dessert, carrot cake, [a prizewinning recipe] and I made it today. It looks amazing, better than I made it last time. I'm not sure about why as it turned out right last time however this time it just seems exceptional so I just hope it tastes as good as it looks. I also made potato salad because he really likes my homemade recipe for that too. Larry is going golfing this afternoon/evening and I'm working on the house, cleaning, ironing, returning phone calls & e-mails, laundry, weeding, and I'll take time in there to walk a few miles. A woman's work is never done. I am so ready for a vaca. 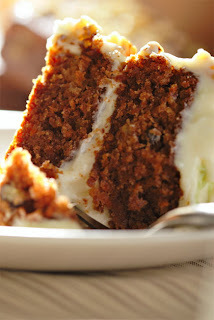 Carrot cake is one of my husband's favorites, too - unfortunately NOT one of my baking specialties :o(. Have a great Sunday morning!!! I've tried making carrot cake in the past and it was way too sweet. Your recipe looks like a nice balance. I'm going to have to give it a try! Mind sharng your potato salad recipe sometime?